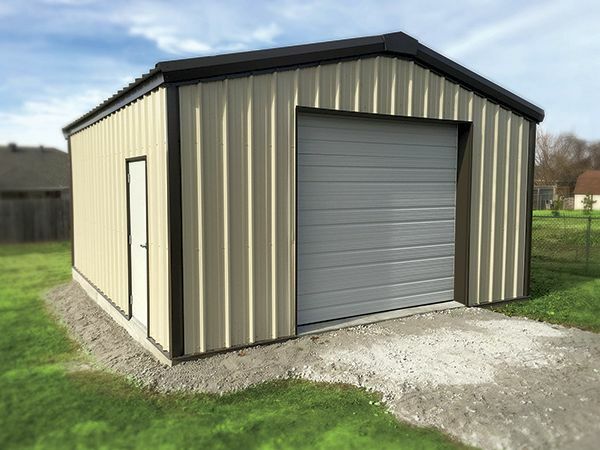 Duro Mini’s Series Bolt-Up Steel Buildings go up quickly and only require a few tools. They are engineered for easy assembly with no welding. Since we manufacture the components in-house, your order is shipped within a few days. Choose the perfect size, and a complete package with easy-to-follow instructions will be quickly delivered. It’s really that simple. How easy is intalling your new Duro Mini? Take a moment to view our intallation video. • Easy to follow assembly instructions and construction plans. • 8″ 16 gauge, red iron roof purlin, flush wall girts, eave struts, and endwall columns. • 8″ 14 gauge, red iron sidewall column and rafter. • 14 gauge, red iron base angle. • 3/8″ thick steel structural plates. • Universal bolt package for simple installation. • Prime, 26 gauge acrylic Galvalume® R-Loc™ – 3:12 pitch. • Prime, 26 gauge CentralGuard® painted R-Loc™. • Painted 26 gauge trim package includes base, rake, formed ridgecap, corners, eave and peak box trims. • Door trim package includes painted jamb/header and jamb cover trim. • Roof and wall closures. • 1 1/2″ structural A325 bolts and nuts. • 1 1/4″ masonry drive-in anchor for base condition. • 1 1/4″ self-drilling fasteners. • 1 1/4″ A307 fin neck bolts and nuts. • 3070 steel walk door, jamb and lever lockset. • 40-yr. limited paint warranty on painted panels. • 25-yr. perforation warranty on unpainted panels. *10′ H framed openings are available on 12′ H building packages only.